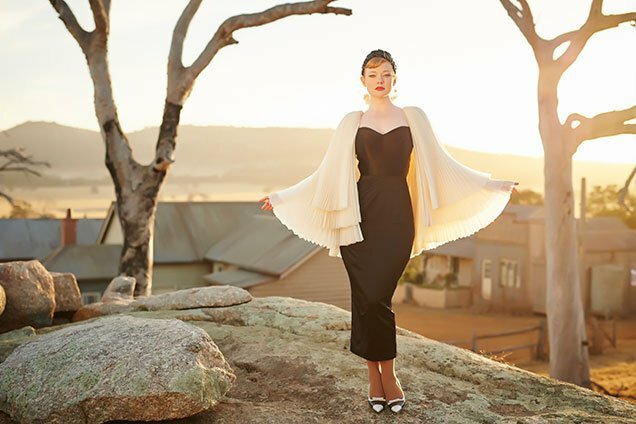 The Australian outback is perhaps the last place you might expect to find high fashion, yet in The Dressmaker, it proves to be the perfect backdrop for some of the most stunning couture creations to grace the silver screen in years. Kate Winslet stars as Myrtle ‘Tilley’ Dunnage the titular dressmaker who returns to her home town of Dungatar, having been run out of town as a child after being wrongly accused of the murder of the town councillor’s son. Now a successful dressmaker, Tilly comes home to care for her sick mother Molly (Judy Davis) as well as to get to the bottom of what happened all those years ago. And her weapon of choice is fashion. Needing information about the events of her youth, she begins to barter dresses for secrets from the town’s women. In the process she starts a bit of an atelier arms race, the women of the town in a fierce competition to have the most fabulous dress. Thus begins Dungatar’s unravelling, exposing all the tensions and jealousies that were simmering just below the surface of the town’s veneer of morality and community. While this isn’t great for the town and people of Dungatar, for those of us in the audience who love fashion, it provides a fantastic selection of costumes to delight and dazzle our eyes. 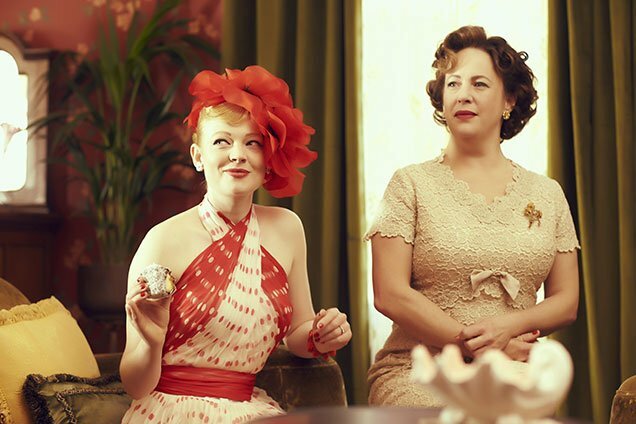 The Dressmaker had two costume designers, with Margot Wilson handling all of Winslet’s dresses while Marion Boyce dressed the rest of the cast. Let’s take a closer look, shall we? One of the film’s early pivotal points is when Tilly arrives at the rugby grand final between Dungatar and their neighbouring town of Winyerp wearing a quite literally game-stopping red dress. Distracting the players, Tilly proves a point to the local women that a dress can have a huge impact. And what a dress to do it in, made from a Milanese silk moire taffeta that Wilson bought over 25 years ago, this dress would prove to be the costume she had been waiting for. And, thankfully, she did as this is one of the standout pieces from the film. Having spoken to Tilly at the football match, Gertrude Pratt, the daughter of the general store owner, becomes her first client after seeing first hand the power of her creations in capturing the attention of the town’s men. Initially sceptical, Tilly transforms Gertrude from the grubby and shy store owners daughter into the stylish and sophisticated “Trudy” with this amazing dress for the Footballers dance. Made of a fine silk net in a white with a shade of mint and adorned with Swarovski crystals, vintage jewellery pieces, sequins and three layers of silk chiffon underskirts all flowing from an eggshell satin wiggle dress, the gown is the perfect dress for this character’s Cinderella moment as she enters the dance and captures the attention of her crush, the affluent William Beaumont (James Mackay). One of the most unique pieces seen in the film appears when Tilly is shooting golf balls into the town, wreaking havoc on their front yards. Decked out in a stylish pantsuit with matching hat, Morehouse wanted Tilly to have an air of the gunslinger about her for the scene and so Wilson added the bandolier like tee holder detail on her hip. A small addition to be sure, but it adds a dramatic quality to the outfit that not only supports the action of the scene but also looks fabulous, the asymmetry of the detail adding panache to what may otherwise have been a little boring compared to the rest of Tilly’s clothes. 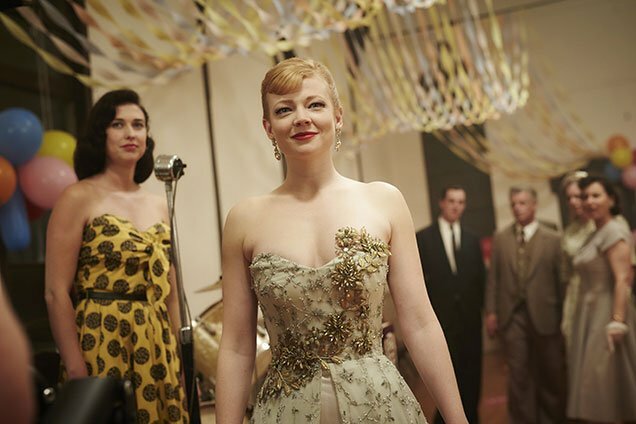 After Tilly’s dress leads to her winning the heart of Beaumont, Trudy as she comes to call herself rises in station. Seeing herself as the Queen Bee of the town, she continues to use Tilly’s creation to support her social position. Beginning with the Red Poppy headpiece, Boyce then found a stunning 1950 Sonia Rykiel silk chiffon halter neck top to complete this whimsical and colourful number. Serving as a brilliant reflection of Trudy’s transformation, capturing her between the wide-eyed girl she is at the start and her delusions of grandeur to come. Speaking of Trudy’s delusions of grandeur, as her character becomes more and more of a domineering social presence in the town, so do her outfits. Where in the Red Poppy dress we saw her at her most whimsical, here we see her at her most dramatic and her most elegant. 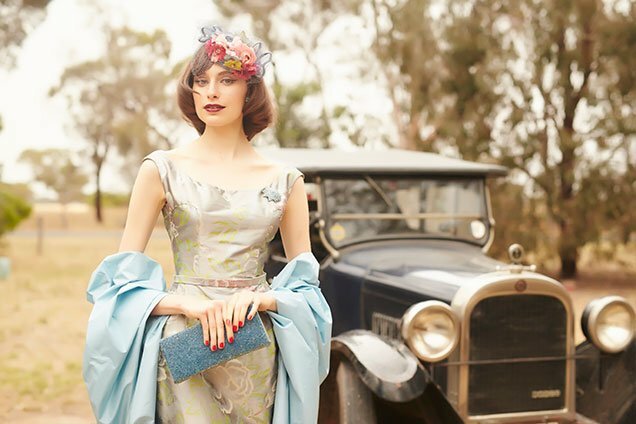 Wearing a cape made from an eggshell silk organza (requiring 30 metres of fabric) matching with a simple yet elegant black satin duchess wiggle dress, the outfit recalls both the elegance of Paris in the 20s and the large winged birds of the outback, which Boyce cites directly as an inspiration. Trudy, of course, isn’t the only woman in the town who enlists the skills of Tilly. In fact, Trudy forms her own squad of not so demure couture enthusiasts, of which Prudence Harridiene (Hayley Magnus) is one. While not hugely important to the narrative of the film, serving more as a supporting character to show Trudy’s growing influence in the town as she transforms into a manipulative and cruel character, she is nevertheless giving the full costume treatment by Boyce. Outfitted here in a silvery grey silk taffeta with a dusty pink and aquamarine bird design, matching donut shawl all topped off with a Wedgewood blue cocktail hat with pink and crimson flower embellishments, you’d never guess this was a supporting character from the costuming. Keeping with the supporting cast of Trudy’s acolytes, Nancy Pickett (Amanda Woodhams) and her midnight blue silk fishtail cocktail dress certainly deserve a mention. Matched with a hat that features some stunning blue cornflower decorations as well as a jaunty quill, nothing about this outfit suggests anything less than leading lady despite her supporting status. This is true of a lot of the film’s other characters as well, including a certain policeman. Set up as Tilly’s only friend in Dungatar, town constable and local crossdresser Horatio Farrat is one of the film’s most sympathetic characters. This is in no small part due to the always charming Hugo Weaving, who brings a hint of farce into story as well as a gentle sensitivity through his portrayal. Living a double life where he must conform to the town’s ideals in public, while crossdressing in private, Farrat and Tilly bond over their love of couture, forming a friendship which in many ways serves as the heart of the film, Tilly even bribing him with a feather boa to let her look into the records of her past. 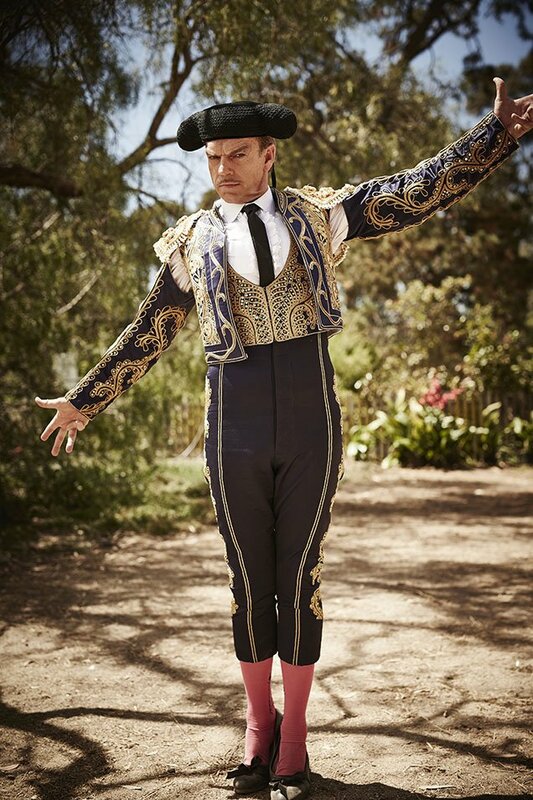 However, his standout sartorial scene comes when he puts on a matador’s outfit and for once can enjoy his love of dressing up in a more public way. And just look at him in it, he is a vision and I really hope this comes around as a trend. The end of the film comes with Tilly’s dramatic departure from the town. Having gotten to the bottom of what happened in her childhood, finding out more than she bargained for in the process, and with her revenge on the townspeople afoot, she takes her sewing machine and leaves, looking fabulous as she does. Wearing a mustard and black wool coat over a slub yarn silk suit and black gloves, the dramatic matching of colours perfectly reflects the style of her departure. Capped off with a vintage black straw hat with ostrich feathers falling over the brim, the final scene of the film shows us Tilly as the resolute, stylish and self-possessed woman she was at the beginning, but now with her past behind her. While the other characters have their emotional journeys shown through their clothes, it is interesting how this outfit and the Dior inspired dress of the beginning, in a way, mirror each other. As if to say that Tilly found exactly what she expected to find in Dungatar, although perhaps not the transformation she wanted. The Dressmaker is out now on 4K Ultra HD™, Blu-Ray™, DVD & Digital.